Hi folks! I first of all want to thank you for your absolutely HUGE outpouring of love and support in response to my UX/UI bike sketch! It was RT’d, favorited, and downloaded an astounding 3000+ times internationally over the course of the past few weeks! Your kind words and tweets about the sketch absolutely made my entire year! Love you all! You can check out the full selection of available items at http://society6.com/userexperiencerocks. If you really enjoyed another sketch I’ve done, and would like me to add it to the print library, just let me know and I’ll do my best to get it up there! Someone asked if I make any $ on the sales of these items, I get about 10%! I like your sketch. A lot. 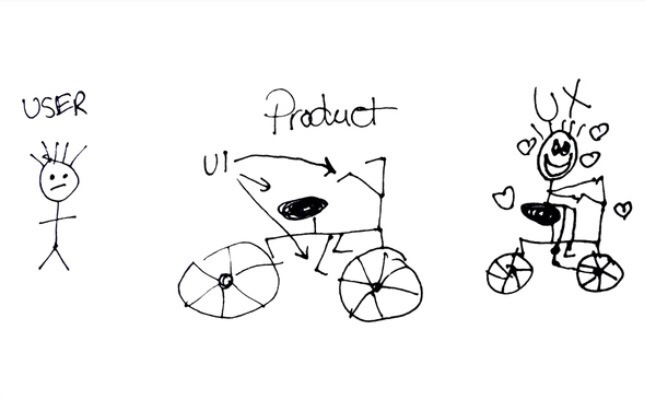 Then I thought about the bike as the UI, as you’re mentioning in it. It’s where I disagree. The bike is the “machine”, the tool that we use to enjoy the experience. Like at my desk, my chair, my mouse, my computer are the tools. The UI in that case is the road. Because the road force me to interact with the machine’s commands (handlebars, pedals, brakes…). The user bought the bike to deal with the different types of road, and of course expect to have a great experience. After some time, you’re enjoying more what you do with your bike, than the bike itself. The “machine” works, the “UI” is transparent, then comes the emotions of the UX. Continue your amazing sketches, I love them. (Sorry for my poor english, not my native).